1.Cut two pieces of chipboard 19cm x 10cm. 2. Cut two 10cm strips of chipboard and glue together to make a double thickness piece to use as a spacer. 3. Cut two pieces of It’s Cold Outside paper to measure 30cm x 15cm. 4. Join the two pieces of paper together on the short edge to make a long strip. 5. Adhere the chipboard to the paper strip with a gap between them, using the spacer piece to ensure that the gap is double the thickness of the chipboard. 6. Wrap the long edges of the paper over the chipboard and cover the gap on the back with more patterned paper. 7. Gently ease the covered pieces into a triangle shape and fold the bottom overlapping paper to form a base approximately 7cm wide. 8. Unfold and punch holes approximately 2cm from the centre point (top edge of the triangle) and approximately 3cm in from the edges. Fold back into a triangle and secure the base, trimming the papers as necessary. 9. Attach the book rings to the top of the calendar. 10. Die cut 32 medium stockings and glue the pairs together to get a sturdier die cut. Ink the edges lightly with blue ink. 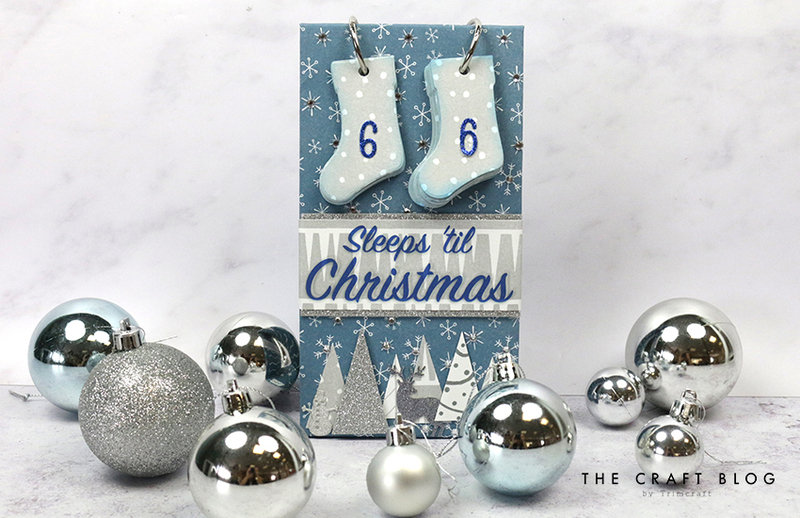 Create a template stocking from a scrap of card to ensure all the stockings have the hole punched in the same spot and to make sure there’s enough clearance for turning when on the book rings. Punch all the stockings. 11. Die cut 0 - 9 from blue glitter card for one pile of stockings and 0 - 5 for the remaining stockings. Attach the numbers and thread onto the book rings. Add more stockings and numbers if you’re planning on starting your countdown before December. 12. Attach a strip of glitter card just below the hanging stockings and top with the ‘Sleeps ’til Christmas’ title either printed, as I have, or using stickers or die cuts. 13. Cut several naive tree shapes from the It’s Cold Outside paper pad and glitter card. 14. Die cut a reindeer and snowman from glitter card and adhere the trees and die cuts to the lower section of the calendar, using the image as a guide. Break out the Christmas List and get to work! Will you be making your own Christmas countdown calendar? We would love to see if you do, so don’t forget to share your makes in the Inspiration area and to #Trimcraft when uploading to social media! You can also find Michelle on Instagram, so why not give her a follow to see more wonderful makes? This is soo cool, thanks sooo much, hope we can get this done with the girls here sometime soon.